I recently had a conversation where it was noted that navigation is possible using only an accelerometer, since turns register as acceleration in the lateral direction. On further reflection, I realized that this is true only as long as you know something about how the accelerometer is mounted. For instance, if you’re in a car, then the direction you’re facing changes as you turn and always coincides with the direction in which you’re moving. Gyroscopes are typically included for a more general solution that gives independent information on the direction you’re facing. In a car, the accelerometer and gyroscope should agree (albeit with very different math). If they don’t agree – that is, if the accelerometer thinks you’ve turned but the gyroscope doesn’t think so – it probably means something not good is happening. As in, you’re skidding or sliding on ice. Which got me thinking: If you instrumented a figure skater with accelerometers and gyroscopes, what would they be saying during some outrageous maneuver? (OK, they would probably be saying something like, “00001112358ADFFFFFWTFFFFF,” but that’s not particularly helpful.) So this is an attempt to imagine sensors on various locations: the top of the head, on each shoulder, on the hands, on the feet, and… well… here’s the tough one: at the center of mass. Tough because, of course, it moves around. So we’ll simply have to imagine a floating set of sensors for that. We can do gedanken just as well as Einstein. Now, to be clear, I’m not a figure skater, nor am I particularly familiar with the intricacies of the sport other than what I’ve seen in the Olympics. To me, all the jumps more or less look alike, so the names of them and the other maneuvers are something of a mystery to me. (Although I could have sworn my high school PE teacher had numerous conversations with me about the Lutz, even though I could swear he pronounced it starting with a “k”…). So I’ve had to do some basic research in order to pretend to appear somewhat knowledgeable. So let’s start the routine. Our skater moves from the side to the center of the rink; all accelerometers register the start and the stop. Right before she* slows and stops, she spins around to face where she started. Now the gyroscope registers the turn. Since she didn’t change actual speed while turning, the accelerometer at the center of mass shouldn’t have registered anything. The accelerometers on her extremities show activity consistent with moving in a semicircle. Following the turn, however, when she starts to slow, the center-of-mass accelerometer will actually think** she’s starting to go faster. Why? Because its frame of reference has reversed. Positive and negative in the X and Y dimensions have flipped. The accelerometer itself has no way of knowing this – which is where sensor fusion between the gyroscope and accelerometer comes in. The accelerometer may be signaling a speed-up, but the software knows that the gyroscope has signaled a 180° turn, so it knows to interpret the new accelerometer data as a slowdown. The sensors on her head and outstretched legs are now registering constant acceleration in whatever direction they’re not going and a concurrent change of facing direction. The ones on her standing foot indicate no acceleration but continuous spinning, as do the sensors at the center of mass. She comes out of the spin and accelerates backwards, leaning back to glide in a circle. All sensors register the circular motion, with those on her head indicating a slightly tighter radius than those on her toes. Now she lines up to do a jump. Her first move is a toe jump, so most of the sensors show her accelerating, going vertical while still moving forward, spinning several times, and landing with instantaneous vertical deceleration as she hits the ice and comes out of the spin. But the sensors on one of her feet register a sudden deceleration as she jams that foot to start the maneuver. As she moves into a spiral, she extends one arm out to the side and, with the other, reaches back to grab the raised leg. As the elevated foot moves forward, it’s accelerating faster than the rest of her; as the arm moves back, it decelerates slightly relative to her center of mass. Once in position, all sensors register the same motion, much as they did when was leaning backwards. The NFC capability accompanying the sensors on her hand and foot exchange phone and email information and decide to do lunch sometime soon. She next attempts an edge jump, in which, to the untrained eye, everything happens just as it did with the toe jump, except that there’s no deceleration on the launching foot. OK, realistically, the untrained eye (mine in particular) wouldn’t even notice the initial toe jam, except that the sensors told us it happened. So the fact that she can now launch off of an edge looks like magic, except for the slight vertical descent on her push foot right before she rockets into the air. Unfortunately, she doesn’t land this one so cleanly, and all the sensors register a rather chaotic trajectory as she tumbles onto the ice and recovers her pose and composure. It’s hard to make sense of the sensor signals, but all register a rather incoherent set of hard decelerations. In these times of increased security, we have also thought ahead to instrument our skater with a magnetometer. While it can help to re-orient the system if the gyroscopes get dizzy with so much spinning (with tilt compensation working double-time), it has an extra feature for us: detecting magnetic anomalies. Like anyone carrying too much metal and coming on the ice, like, hey, who’s that guy and why is coming towards her? And what is that thing he’s holding? The magnetometer is going crazy! And security rushes on and grabs him, and she swoops around the other side of the rink, and, to the audience, it was all an elaborate part of the routine. And she finishes, dropping down to the ice, head bowed, as if about to be knighted, to thunderous applause. The sensors can finally take a deep breath and wipe their brows. And the rest of the job falls to the judges. Actually, really sophisticated fusion software could take the place of human judges, detecting the various jumps and moves, assigning difficulty points, and evaluating execution. Of course, it probably couldn’t take into account the other necessary factors – such as who was supposed to win or which country we’re mad at now or whom we’re tired of everyone loving. Hmmm… perhaps someone needs to invent a snark sensor or a social senses sensor (which many of us in engineering-land would pay extra to use) and include that in the sensor mix. * OK, it could be a “he,” but really… did any song hit top 40 after a male skater used it? While this flight of whimsy mixes fact with fun, sensors can and are being used in sports. Like for checking head collisions in football (although the g-range for accelerometers intended for shock and impact detection is higher than that for navigation). We also looked briefly at a swimming application some time back. Are you aware of other sports where sensors are being used? What and why? Accelerometers are also used in some “fitness” devices, the latest being Nike Fuelband. These are collectively called “activity monitors”. By acquiring 3-axis accelerations, formula is used to produce an emperical aggregate to represent daily activities achieved. Obviously, depends on how the device is used, results may varied considerably. Accelerometers have also been used extensively in exercise science research for many years. Interesting article, Bryon, but perhaps not as much of a flight of whimsy as you might think. I speed skate, and I know a skater in Scotland who has looked at using strain gauges on skate blades. 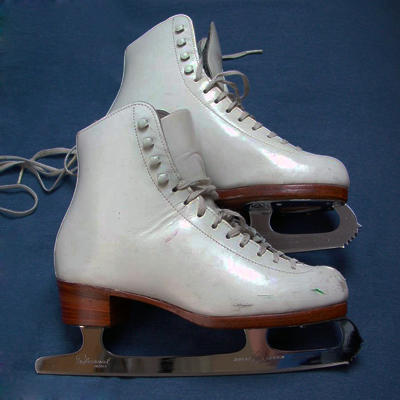 For speed skating, you don’t want to be twisting the blade, as this will slow you down. He’s also tried microphones, to see if the sound that the blade makes is a good measure of whether the skater’s technique is good or not. Sound is a really interesting thing to measure: it’s a great way to understand the stresses at the interface between the blade and the ice. In fact in his autobiography, Apollo Ono says that one of the things that made him realise he has potential as a speed skater was the fact he made less noise when skating than others in his club. So I’d definitely add a microphone to the transducers your skater is using – in figure skating, your electronic judge would definitely want to use this to ensure that jumps were landed cleanly.